Central Board of Secondary Education (CBSE), Delhi has released online admit cards/ calll letters / hall tickets for written examination to be conducted on 22nd February 2015 for eligibility for the posts of PRT & TGT. Earlier had invited Applications for CTET EXAM 2015 through the notification provided on the official website and successfully completed the process of filling ONLINE applications for eligibility for the Post of Primary Teachers and Graduate Teachers. The latest news that CTET online Admit Card link is available for the written test of CTET Exam 2015 which is going to be conducted on 22nd February 2015. Those candidates who have applied for the post and waiting for admit cards can download their admit card on the direct link provided in the end of the post. The CTET EXAM will be conducted on 22nd February 2015. The exam will be conducted by Pen MODE. The exam will be entertained through filling of circles on Computer Generated Page known as OMR Sheet containing information of questions and answers will be selected by filling circles in it. There is OMR sheet to be filled by Blue/Black ball point pen. The exam consists of various sections English, Reasoning, Quantitative Aptitude, General Awareness and subject related questions. The exam will be a multiple choice question paper of total 150 questions for 150 marks and four options are provided out of which candidates need to choose one correct answer. The time duration for exam is 1 ½ hours or 90 minutes. For more information candidate must download syllabus and exam pattern of CTET EXAM from the official website. Exam will be conducted on the scheduled time mentioned in CTET Admit cards of the candidates. The Official Answer keys may be discussed on the official website of CTET EXAM. 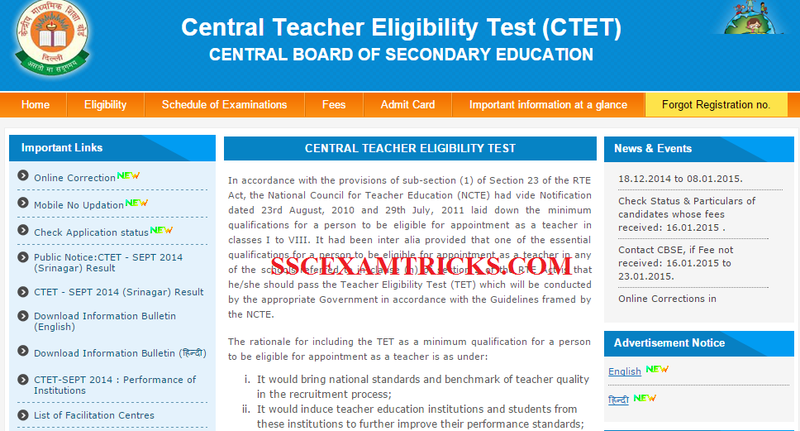 Click here to download Complete Advertisement of CTET 2015.